Keep America Beautiful, the nation’s iconic community improvement nonprofit organization and a Carton Council partner, inspires and educates people to take action every day – not just during Keep America Beautiful Month or on Earth Day – to improve and beautify their community environment. We believe everyone has a right to live in a clean, green and beautiful community, which includes improving recycling in America. Most of the time that my colleagues and I spend focusing on recycling issues is spent talking about the technical side of recycling. But there’s been much less discussion among these same stakeholders about steps we can take today – in the context of the current recycling landscape — to make recycling more successful. That’s what we do at Keep America Beautiful. 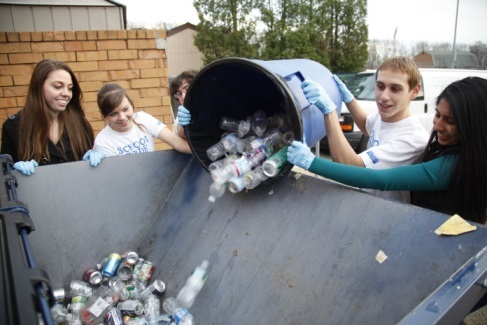 When it comes to our work to improve recycling, our focus is clear: We educate, motivate and activate people to recycle. We know people in America have a strong intent to recycle. Collectively, as stakeholders in this sector, our job is to make the act of recycling as easy as possible for people. Research conducted in partnership with the Ad Council in the development of Keep America Beautiful’s “I Want to Be Recycled” PSA campaign is clear: Americans want to recycle. Approximately two-thirds of respondents said recycling is a very important or extremely important issue to them. Furthermore, what resonated most with adult audiences interviewed was knowing that their “garbage” did not have to be wasted, but in fact could be used to make a new product. When you give your garbage another life – by recycling – you create something new. And that includes recycling food and beverage cartons! First, people want to recycle. Or, as we like to say, they want to #BeRecycled by making recycling a daily social norm. Moreover, they want easier access to recycling and are actively seeking information about recycling. Second, people believe in the “Reduce. Reuse. Recycle.” mantra. They want to reduce the amount of waste going to landfills. They understand the role recycling can play to conserve our natural resources. And nearly 40% want to reduce their own negative impact on the environment. And, third, beyond the environmental and social impact of recycling, people want to #BuyRecycled. They prefer to buy from companies that use packaging that can be recycled, that use recycled content in their packaging, and that encourage others to participate in the act of recycling. And this is particularly true of the incredibly valuable, highly desired millennial generation. Critical to our success is to make recycling convenient and an easy action to take by educating and engaging individuals to recycle more of the right things the right way – at home, at work, and on the go. Helping Americans better understand recycling and its economic, environmental and social benefits is a central component in our mission. If we improve recycling, we will advance our fight to end littering and beautify America’s communities. The business of recycling is complex, but the act of recycling can be quite easy. Together, we can help make recycling even more successful – on Earth Day and every day.